This is the Orrb. 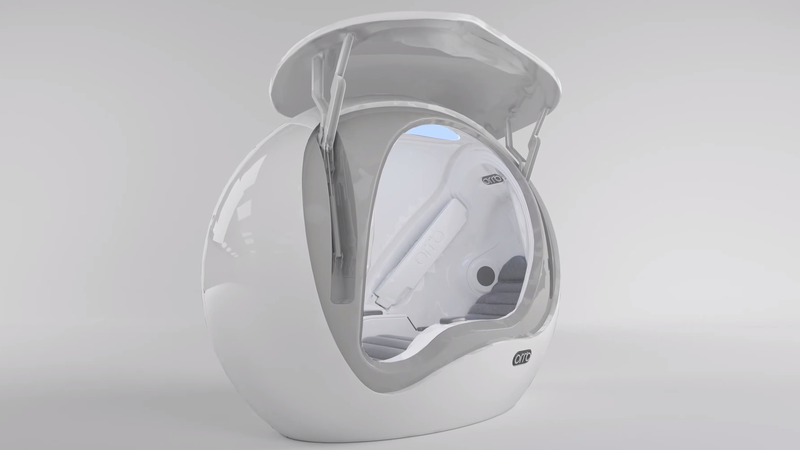 The futuristic pod is just large enough for one human to sit and stare at a screen in total isolation for the sake of "wellness and learning." It's like one of those nap pods you might find at Google, only more private and, somehow, more alien-looking. You know you want one. Let's back up a second. Does any company really need isolation pods for their employees? Is working in the 21st century so downright dystopian that we literally need to hide in a shiny bubble to stay sane? What does it really do? "[The Orrb] basically provides a sanctuary, where people can relax, recharge and work on self development," Orrb Technology product designer and founder Lee McCormack told Wired recently. "It's difficult for people to engage in what they're doing if they're not relaxed"
Well, that kind of makes sense. But whatever happened to yoga breathing and mindfulness exercise? That's actually what the Orrb really does. You select a five, ten, or 15 minute "wellness session," and the Orrb takes you through some simple breathing and mediation exercises to help you relax. Orrb Technologies also charges a subscription fee for the content. You could, presumably just take a nap in the damn thing, too.